Princess Diana Memorial: Friends Are Out Enemies Are In! Poor Princess Diana, even in death she can't get a break from the royals! The memorial service scheduled for the 10th anniversary of Princess Diana's death is fast becoming a platform to settle scores! Perhaps the biggest bone of contention is the fact that many of Princess Diana's closest friends have not been invited while several persons the late Princess detested have indeed made it on the guest list. Somewhat surprisingly out of the 500 or so people thus far invited, many of them never even knew her at all! The fact that only 500 seats out of 700 will be filled is testament to the acrimonious atmosphere surrounding the impending memorial service. The attendance of HRH the Duchess of Cornwall otherwise formerly and best known as Camilla Parker Bowles is the thorniest issue so far. Prince Charles is sticking to his guns and insisting that Camilla must and will be by his side at the service. Apparently Charles is the only person on planet earth who thinks that Camilla's attendance is a good thing…and he still harbors hopes of being King one day! The Queen wise and full of wisdom as ever went as far as to suggest that Camilla should find herself fortuitously unwell on that day! Charles obsession (everlasting love?) with Camilla was the catalyst and reason that the marriage between Princess Diana and Prince Charles failed. As Diana once wryly put it: hers was an overcrowded marriage of three! Princess Diana Blog Falls Foul of Google! Princess Diana Death: The MI6 Connection! 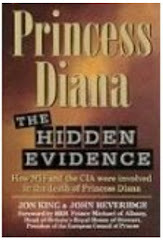 Princess Diana Death: Trapped In A Web Of Spies! Princess Diana:Killed Because She Was Pregnant? An unknown Car Blocked Avenue de Champ Elysees So They Took The Tunnel! 1st Doctor On The Scene: "I thought her life could be saved." ProfessionaL Drivers Refute 120 MPH Claim As Ridiculous! Eye Witness: I Saw White Fiat That Caused Crash!